In season three of Ride with Blake we decided to focus on producing themed playlists. Blake and I took an RV road trip along Michigans west coast to produce a "Jump with Style" playlist. Our aim was to teach kiteboarders how to improve the way they jumped and to help them develop a large bag of easy, yet awesome-looking kiteboarding tricks. For season four we decided to build on that idea. We'll be producing the ultimate kiteloop playlist- a progressive kiteloop playlist starting with the basics. Our goal is to help you progress into all the different varieties of kiteloops and build on many of the tricks we covered in our last playlist. This is the first video for our Kiteloop playlist, so it will be a broad overview of the three basic loops and 5 different tricks that we'll be covering in this series. We've much more planned than just these 5, so stay tuned for our bi-weekly releases. Kiteloops are a huge part of our sport and they have a certain stigma to them. That said, some loops are safer and easier than others. There are also different ways to implement and practice them in a progressive way. Before you attempt a trick, it’s important to understand what you are trying and to be able to visualize yourself doing it. A kiteloop is a full rotation of the kite in the wind window where it generates extra power and pulls you downwind. The extra speed and downwind pull makes the kite more powerful, so make sure always to point downwind and not hold an edge against the kite. Think about which way the kite will travel depending on the direction you send it into a loop. You can send the kite into a loop and release it in different places throughout the wind window. For instance, if you continue holding the bar after the kite has made a complete loop, then it will continue into a second loop. Knowing when to release the loop is also a very important concept to understand. Steering a kite is simply the lengthening and shortening of the two lines. The line that is shorter is the pivoting point of where the kite will loop. The harder you pull it and the longer you hold will determine the speed and direction of the loop. Pulling in on the bar will make the kite steer and pull harder, so once the kite makes a complete loop you can sheet out on the bar, making the kite launch into the air and catch you. If you keep the bar pulled in after the loop, the kite may stall and drop you into the water. Practice your first kiteloops with a small kite in light winds, just enough to keep the kite flying. If you have a trainer kite then that’s an even better way to start. Widen your grip on the bar for extra leverage and faster steering of the kite. If you keep your hands close together, it will be harder to get the loop quickly around. A tighter loop will give less pull; a wider loop will generate more pull. In order to make the kite do a loop, you are going to have to pull in hard on one side of the bar and hold it until the kite makes a complete rotation. Think of it as riding a bike: the harder you turn the handlebars, the tighter the turn. If you twist the handlebars like a steering wheel, then you will probably fall over and the bike won’t turn. So remember to pull hard on the bar and hold it until you have completed the entire loop. Now that you understand what a kiteloop is and how to control it, it’s time to learn the different kinds of loops and how they apply. There are many ways to use a kiteloop, and not all require you to jump or be in the air. Don’t let the term “kiteloop” scare you out of giving it a try. Everyone has accidentally looped their kite before, so if you can understand how it works and use it to your advantage, then why not give it a try? The simplest of all is a downloop. The reason this is the easiest is because it is not a full loop and can pull you into a water start or transition. If you pull a downloop too early, it won’t yank you like a regular kiteloop. Remember that downloops are front hand, and kiteloops are backhand. Looping the kite the same way you’re going on the way down is a downloop. You can use downloops for water starts, transitions, or jumps, which is especially helpful in light winds. For water starts, rather than sending the kite from the zenith, you can pull it into a downloop which maximizes the wind window and gives you a much greater pull out of the water. For a transition, you simply put the kite high, pull hard on your front hand, let off your edge, follow the kite, and sheet out when the kite is traveling the other direction. Downloops are best used for transitional jumps and turns. If you can already ride upwind and jump, this is where you'll want to start. Downloop transitions are the perfect way to get used to looping. We recommend doing them right after landing a jump or even halfway through a rotation. This will get get you acclimated to doing your first kiteloop-based tricks. Stand by; we have a couple videos planed to help you progress into these. Kiteloops can be intense. The biggest difference with a kiteloop is that it is pulled with the backhand and loops in the direction you’re going. 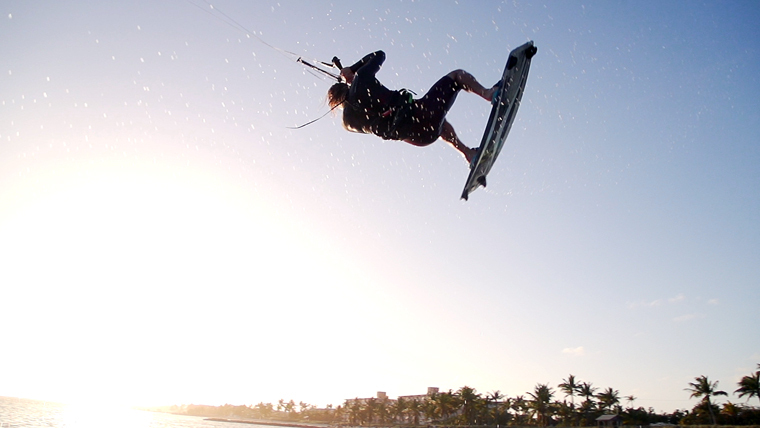 Once you learn the kiteloop it will change the way you kiteboard forever. The easiest way to try a kiteloop for the first time is either on a trainer kite or an underpowered body drag. Walk or body drag in the direction where your strong hand is the back hand. Quickly send the kite, slightly sheeted out, pull in hard on your back hand when the kite reaches the zenith, hold it all the way through 'til it makes a complete rotation, then sheet out. This will pull you hard downwind, so make sure to be ready to follow the pull of the kite; never hold an edge against a loop. Once you get comfortable and understand how it works, try a kiteloop with a waterstart and make sure to follow the pull of the kite as it takes you, and point your board downwind. Next is the jumping kiteloop, and before you know it you’ll be doing backroll kiteloops! The earlier you start your kiteloop, the more power that is available to you. Heli loops are used as a tool for soft and smooth landings after a jump. Different than a kiteloop because they have no power, heli loops are pulled after you reach the peak of your jump, and as you are descending it catches you. A heli loop is a vertical loop rather than a directional loop. It pulls you up, and if timed properly can lift you back up into the air, hence the name “heli” loop. The key difference to remember between a kiteloop, which gives you a strong pull, and a heli loop, which doesn't give you any power, is that a strong kiteloop is pulled before you reach the top of your jump. Make sure you watch the video for five of our favorite kiteloop based tricks. Somethings are more fun to watch than read about. Don't worry, we will be doing full tutorials on the tricks listed in this video. When it comes to kiteloops, most kites will get the job done, especially for beginners. That said, some gear does work much better than others. A great rule of thumb is to learn on something no bigger than a 11 or even 10 meter. Larger kites will still loop but they are much slower, more difficult, and not very effective. There are several categories of kites that cater to different styles of riding. We much prefer the freestyle kites in most brands line ups. That said, many of the freeride kites work. To demonsrate this, we used the Carinha Switchblade 11 to film the majority of this list. The fastest most powerful kites for loops fall in the crossover category. These are three-strut C Hybrid kites designed specifically with kitelooping in mind. The Switchblade is an outlier on this list. It's technically a freeride kite. The FX is superior in speed and arc, yet the Switchblade packs some power. We chose to film with this kite due to its powerful low end. As we were filming in the Keys, the wind could be quite light. We don't recommend going larger than the 11 for kiteloops unless you are an advanced kiteboarder. These are faster freeride kites. Not designed specifically for kiteloops, but as they are all faster they work quite well. They also tend not to be as powerful when looping. The RPM might be the most powerful on this list. These are just a few kites that we prefer. There are plenty of good options beyond these. If you already have a freeride kite and are new to loops, switching too a crossover kite will not make or break your progress. It will however help. If you are a more advanced rider, chances are you've already made the switch to something designed with loops in mind. Either way you go, we encourage you to simply have fun with it. Kiteloops can be scary and like any kiteboarding trick, they can be frusterating. take your time and learn to enjoy the process. -Written and produced by Blake Olsen & Ryan (Rygo) Goloversic. A Michigan boy through and through (even though he was born in Saudi Arabia), Blake is a youth with a lifetime of experiences and adventures. Not only that, he's passionate about sharing his zest for life with others. 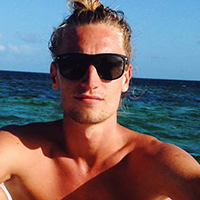 He is proficient at many fields, including kiteboarding and acting as concierge to any who simply ask. Looking for an adventure? Well, Blake is your guy. From sailing the Gulf and the Caribbean to backpacking Hawaii and Southeast Asia, he knows his stuff and can make your vacation into an adventure. Many people dream of quitting their job, traveling the world and pursuing their passions. Rygo is one of those people who pulled the trigger. A few years into a postal career, he decided to change everything and travel as a kiteboarder, freelance videographer & writer. His mission is to help people and share the stoke. Get out there and kite!